Check out these 24 unique travel gifts! A passport cover might not be the most unique travel gift in this list, but it’s a very practical travel gift that every traveller needs. It protects the most precious possession of any type of traveller. So, definitely a good option! You can either decide to buy a mass produced passport cover, or you can make it a really thoughtful gift and get a customised passport cover. On Etsy.com you can find loads of passport covers that you can customise. For instance the pink marble passport cover you can see pictured above! It’s possible to include a name or initials. Another practical gift that is useful for any type of traveller is a travel wallet. So not an ordinary wallet for your money, no, a wallet for securing all sorts of belongings. In this leather travel wallet you can hold an iPad Mini, Kindle, phone, passport, headphones, sunglasses, basically all your travel essentials! It’s also possible to personalise this travel wallet with up to three initials, but it does cost some extra money. Every traveller makes lots of memories during their adventures and have a story to tell. A journal can be a great way to keep track of all their experiences while on the road. A personalised travel journal is a great gift for a traveller, it’s both useful and thoughtful. On Etsy you can find lots of customisable travel journals and notebooks. What about the the luxury personalised travel journal you can see pictured above? This A6 size notebook is hand printed in gold and can be personalised with your chosen name. This item is similar to the travel wallet, yet a bit more simplified! It’s a useful travel organiser that protects important travel documents, such as a passport, cards and tickets. It’s a great gift for the traveller that never seems to have their documents organised. A luggage tag is something you can give to any type of traveller! And isn’t this personalised alpaca luggage tag funny? The alpaca design is double sided with a alpaca on the front and contact information on the back. The text on the front that says “Time for an adventure? Alpaca my bags!” can also be changed to a special custom message or different text, if you happen to know anything else that’s more hilarious. If you don’t really see the humour in the alpaca luggage tag you can also find more personalised luggage tags on Etsy.com! Of course the best gift ever for any travel lover is a surprise trip! It doesn’t even have to be a far away destination, you can also explore your own homecountry by visiting a new city, or even stay in your own hometown in a unique accommodation via airbnb! And why not make it extra special by revealing it with a customised boarding pass? That really is one hell of a special gift! A compass isn’t really a necessary item anymore, with Google Maps and all the technology nowadays. But still, a compass is a very unique gift for a traveller. The vintage-style compass pictured above can be personalised with your own preferred text or name. Do you have trouble sleeping on the airplane? Unfortunately it’s not possible to bring a comfortable mattress on board, but a sleep mask is the step in the right direction. This cute panda sleeping mask blocks the light completely and is perfect for a well-deserved nap on the plane. You may think that jewellery isn’t the most practical travel gift out there, but actually accessoires can make a small wardrobe more diverse. When a traveller is on the road all the time, it can be a bit boring to wear the same outfit every week or so. Some travellers still like to spice it up a bit and by wearing small, minimalistic items you can bring something new to an outfit. What about a cute necklace? Above you can see the beautiful gold chain with compass pendant and the gorgeous, minimalistic gold lariat necklace with an airplane pendant. Read our article with 22 travel inspired jewellery picks for more items. Check out more travel inspired necklaces here. There are also countless travel inspired bracelets to be found. What about these two beautiful options. The left one is a bangle bracelet that includes a compass and a birthstone which you can choice. Or perhaps the the minimalistic heart and airplane bangle? You’ll find plenty of options on Etsy.com! Check out more travel inspired bracelets here. If you’re looking for a ring for someone really special, a ring might be a good choice. Minimalistic rings with a small airplane, a world map or a compass, there are plenty of possibilities! Check out more travel inspired rings here. Another jewellery that you can give to a traveller is are travel inspired earrings! There are a lot of beautiful earrings that are travel inspired, such as pendants with a globe, compass and more cute ideas. Especially smaller stud earrings are a good gift for a traveller, because they don’t take in a lot of space or you can just keep them in all the time. Even if a traveller has multiple type of stud earrings, these don’t take that over that much space! Check out more travel inspired earrings here. Do you want to get more inspiration for travel inspired jewellery? Check out this article with 22 travel inspired jewellery picks! Have you thought about a travel inspired keychain? For instance, the personalised keychain above with travel charms: a tiny camera, postcard, passport, globe, pair of sunglasses and a suitcase. You can even add letters and birthstone charms to make it more personal. On this clear customised phone case you can place hearts on special locations for the recipient. Currently the phone case is available for iPhones and Samsung devices. Of course there are also more options, such as this personalised world map wood phone case, Marble forest phone case or this cute travel phone case. 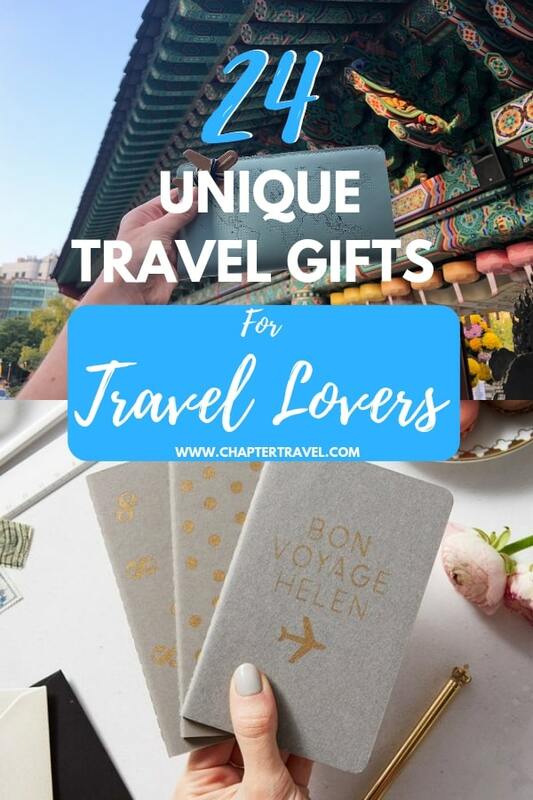 This travel keepsake gift is definitely a unique travel gift! It’s a very tiny map in a tiny bottle pendant and it comes with your own custom map scroll inside. So it’s basically a tiny message in a bottle that can be worn on your neck! Another travel wallet, but with a personal, creative twist! The travel wallet is printed with a perforated world map, so each country can be stitched with a colourful cross. So you can stitch where you’ve been! The back is also perforated, so it can be stitched with initials or any design you like. It’s a unique and practical travel gift! Give a city map print as a present! You can choose any city in the world. Choose the favourite city of your friend and you’ve got yourself a perfect gift! Be aware though, this item is a digital file, not a physical item. You get the item via e-mail in high resolution and you can print it out yourself. Check out this custom city map if you rather get the physical print! Do you want to give your traveller friend something really special? Why not commission a water colour painting of their favourite destination! Just send a photo to Chicago artist Terri Crockett via her listing. This adventure world map can be customised with your choice of colour, text and size and type (poster or mounted). The poster comes with 90 push pins so you can either pin where you’ve been or where you want to go. Do you have a good friend that lives far away? With this Far Away Friend gift set you can show how much you miss her/him, but that true friendship knows no distance. There are two type of gift sets to choose from. For the traveller that is currently at home and would love some inspiration for a next destination: the wanderlust travel desk calender. This award winning unique travel souvenir displays travel signs to highlight various travel experiences. The Travels Tree is a great gift for a traveller that loves travel decor in their home. Another unique travel gift is a travel scrapbook! It’s a great way to cherish memories from your past travels. Either buy one for your travel partner and start the scrapbook together, or buy one for others as a perfect travel gift. Looking for a gift for a very young globetrotter? What about this wooden keepsake suitcase? It’s perfect for a child to keep all their travel memories in one place. Do you have any great unique travel gift ideas too? Let me know in the comments below! Didn’t find the unique travel gift that you were looking for? Well, take a look at my other gift guides for travellers and hopefully you’ll finally find the perfect travel gift! These are epic gift ideas! I’m glad I stumbled across this post this evening as my mum always struggles to buy me gifts for christmas and birthdays. Now, thanks to you I can provide her with this list! So many cool items on here..